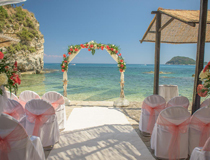 The very pretty island of Zante offers an exciting choice of wedding venues including garden settings, hotels’ poolsides, panoramic cliff-tops, beachside location, and even a tiny island off Zante's coast - whichever your preference, your big day will definitely be very special. 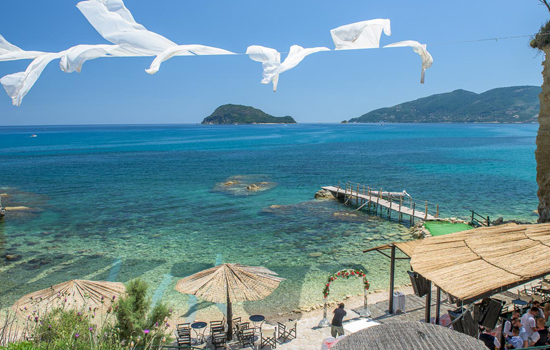 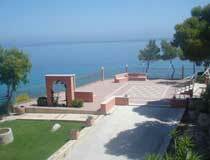 Located in the area of Vassilikos, some 8kms from Zante Town, this is an enchanting wedding venue that offers the most delightful beach setting for your special day. 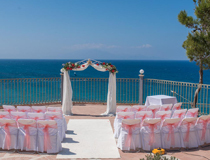 To help you reach your important decision, two choices are initially given here: the first option available is to have your wedding ceremony as well as your wedding reception on site. 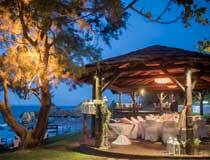 The second option is to simply have the wedding reception at the restaurant (you cannot just have the beach wedding ceremony). 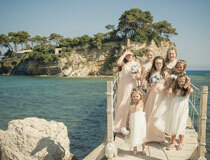 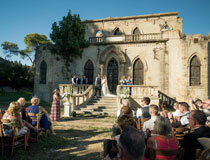 Of course, we highly recommend that you opt to have both the ceremony and reception on-site: not having to travel from one venue to another is far more convenient and, in this case, it gives you all the time you need to fully make the most of this superb setting and even have stunning wedding photos taken on the beach daytime and at sunset! 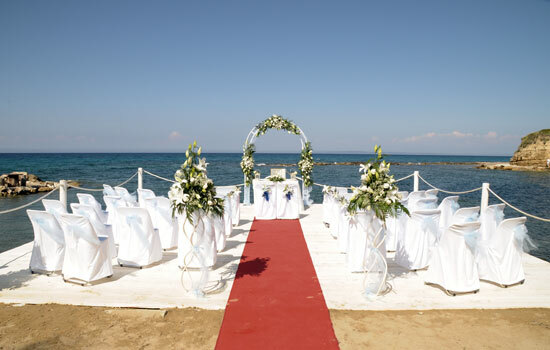 As illustrated here, it's not hard to understand why many couples opt to have their ceremony conducted right by the waterfront where chairs and a pretty wedding arch can be organised on your behalf... plus the chance to have a few drinks on the beach to toast the happy couple after the ceremony. 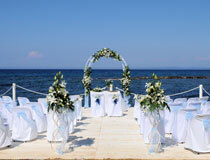 On your wedding day, the setting is reserved for your exclusive use (minimum 20 guests required). 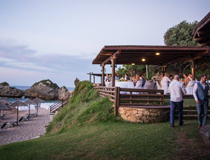 There's a varied choice of menus offering everything from traditional cocktails receptions with canapes to hot or cold buffets or more formal sit-down five-course meals. 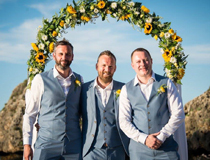 Extra services that can be organised for you include musicians and even a fireworks extravaganza to impress your guests right up to the end of your magical wedding day! 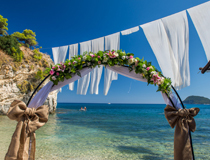 If you’ve always set your heart on a ‘sand-between-your-toes’ wedding, we can make your dream come true at a variety of waterfront locations. 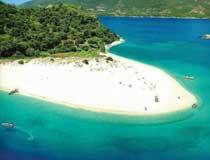 To give you an idea of what could be arranged on your nehalf, we have highlighted below a selection of beach venues available in Zante. 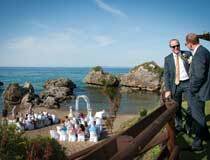 waiting for her on Cameo Island. 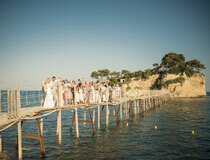 Alternatively, you may use the bridge for a leisurely stroll over the blue water. 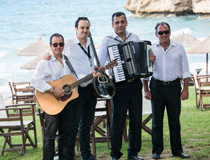 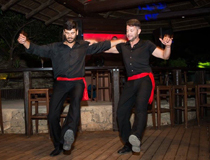 to take place at a local taverna for you and your party. 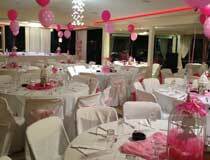 (NB: this venue cannot be recommended to guests with walking difficulties or children in pushchairs). 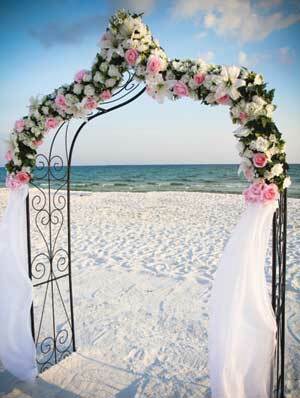 in a such a scenic spot will be a very special and private moment. 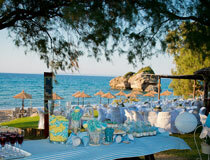 no matter whether you prefer a barbecue or a menu of local specialities. 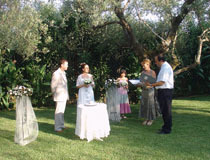 the 'fear' of ruining your gorgeous shoes as the set up up for your ceremony can be on the grass. 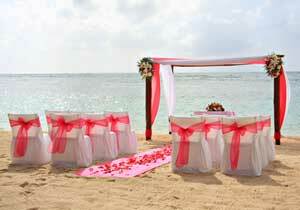 and exchange your vows on the beach itself. 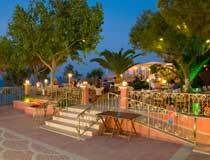 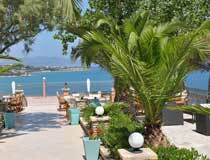 to take place at a choice of tavernas and we'll give you full details of what is available in the area. 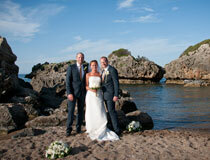 from Laganas to a beautiful white sandy beach on a tiny islet? 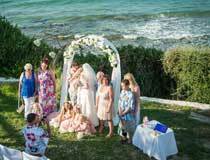 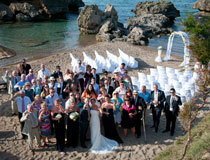 This is exactly what choosing to get married on Marathonisi Turtle Island is all about. 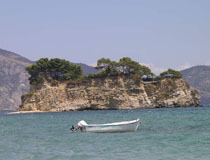 as one of the major nestling grounds of the Caretta Caretta Turtles. 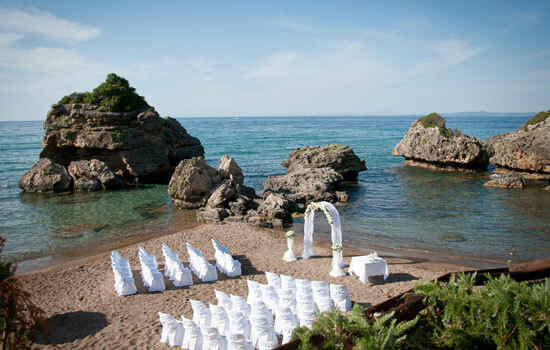 A truly magical spot for a truly memorable, yet simple, ceremony. 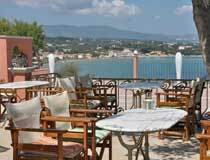 Located on a hilltop with direct access to the stunning beach of Tsilivi 20m below, Balcony Hotel offers an amazingly panoramic setting for your wedding day. 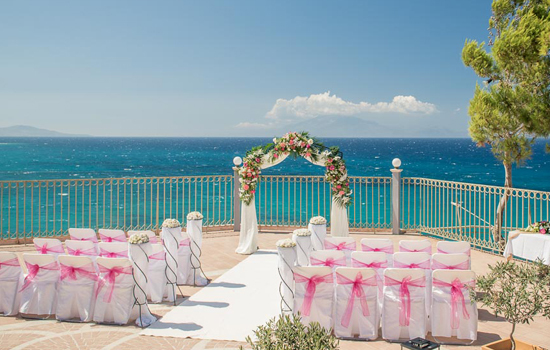 With the ceremony taking place on a paved terrace, you and your guests can indeed make the most of this magnificent backdrop while you exchange your important vows and, of course, the views of the bay will also add the perfect 'overseas wedding touch' to your photo album! 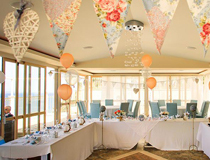 Decorations can follow your colour theme with a wedding arch adorned with flowers or chair covers embellished with gorgeous bows. 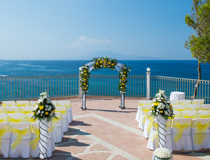 Choosing to marry at Balcony Hotel also gives you the opportunity to follow your ceremony with a cocktail party on the terrace plus a wedding reception that could take place outdoors or as indoors. 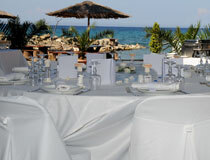 We look forward to discussing the various options available at this terrific venue. 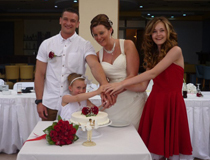 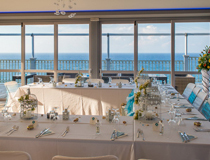 As Balcony Hotel is a very popular venue for weddings and receptions, we advise you to book as soon as you can. 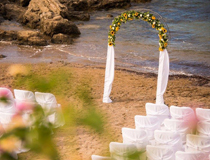 Boasting a prime location, Lesante Hotel & Spa invites you to enjoy the very best day of your life (and your honeymoon) in luxurious surroundings. 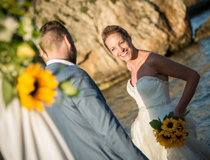 Choose to marry by the poolside, in the gardens or outside the small chapel, all settings provide the perfect backdrops for your photographs. 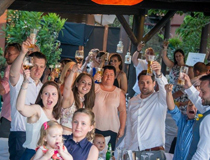 There are plenty of options too for your reception at the hotel and celebrate in style with family and friend (it is a compulsory requirement to have your reception on site in order to get married at Lesante). 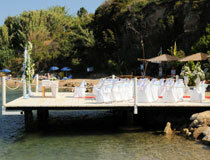 Located by Krioneri Beach between Zante Town and Akrotiri Cape, this very pretty venue combines a picturesque setting for wedding ceremonies with the chance to also have your reception on-site.The bride can make a grand entrance to meet up with her groom and guests waiting for her on the grass area set up with chairs, tables, etc. 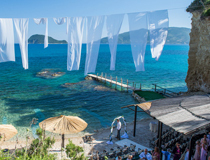 After the ceremony, enjoy a few cocktails with family and friends, a meze-style menu, a 3-course meal or a barbecue... all pretty picture perfect! 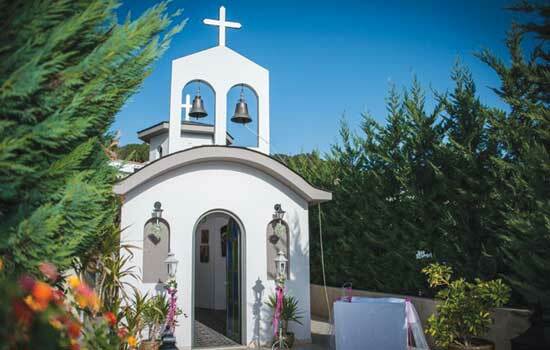 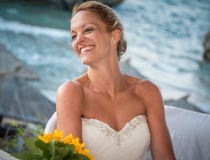 For something totally different when you choose to marry in Zante, The Mansion is an enchanting wedding venue located inland in Kalipado, some 5km north-west of Zante Town. 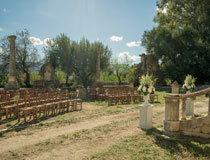 The beautiful rural surroundings add a true rustic flavor to this vintage venue option. 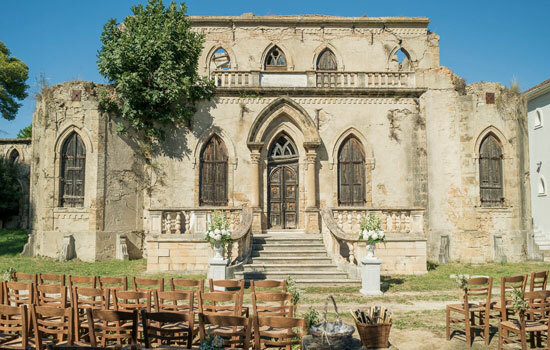 Built in 1908, the 19th century architecture of The Mansion is the perfect canvas for those looking for a very private and unusual setting for their special day. 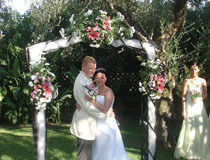 The Mansion is encompassed by nature with an archway of magnificent trees leading up to where the ceremony takes place on the steps in front of the antique door. 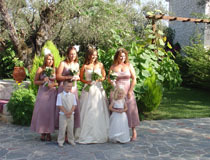 All in all, a charming wedding location for you to share your celebrations with family and friends. 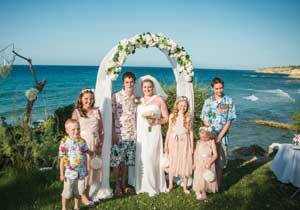 Garden weddings are popular as they offer great privacy to enable you to savour your precious moment just surrounded by family and friends. 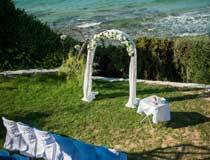 One of the various venues we can suggest to you for this type of wedding is Ktima Kourou, a country farm estate in Tragaki (about 300m from the beach and 2km from Tsilivi). 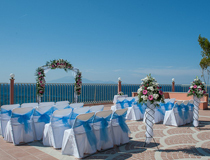 Alternatively, if you prefer to exchange your vows with a sea view background, we have a variety of panoramic terraces where your civil wedding can be conducted. 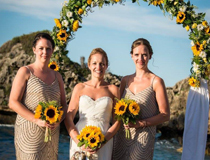 As always, special touches such as flower arches, horse-drawn carriages, etc., can be added to your wedding package to make it as personalised as you wish it to be and we will also be able to recommend local tavernas and restaurants for a wedding reception full of local flavour. 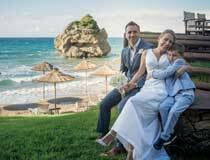 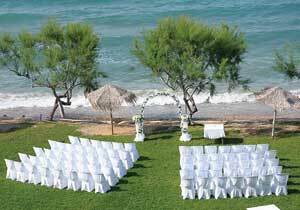 Boasting a prime location on Tsilivi beach (just over 4km from Zante Town), the Alexandra Beach Hotel is one of the latest additions to our weddings programme on this popular island. 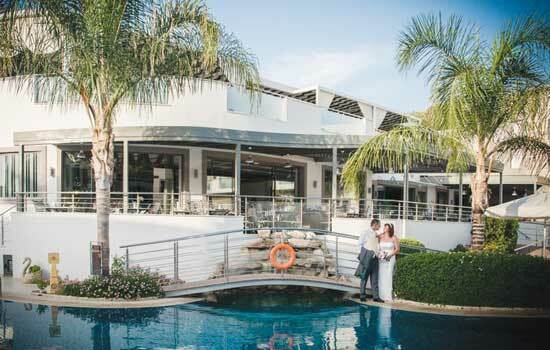 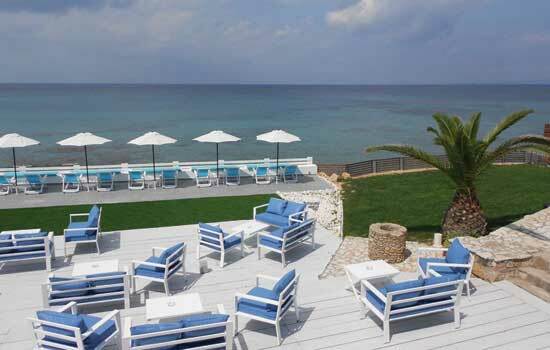 The choice of wedding venues at this friendly 3-Star hotel includes the restaurant's outdoor verandah, the sun terrace by the outdoor pool and not least the waterfront wedding platform that juts out over the sea. 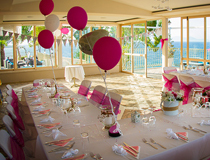 Excellent attention to detail and a professional service will ensure all aspects of your special day will be taken care of. 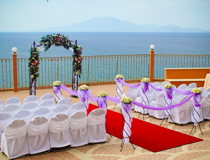 As expected, chair covers, flowers, reception at the hotel, etc. 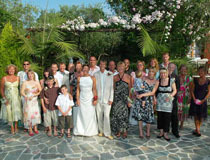 can be organised on your behalf.